Mention robots to many English teachers and they’ll immediately point down the hall to the science classroom or to the makerspace, if they have one. At many schools, if there’s a robot at all, it’s located in a science or math classroom or is being built by an after-school robotics club. It’s not usually a fixture in English classrooms. But as teachers continue to work at finding new entry points to old material for their students, robots are proving to be a great interdisciplinary tool that builds collaboration and literacy skills. “For someone like me who teaches literature by lots of dead white guys, teaching programming adds relevance to my class,” said Jessica Herring, a high school English teacher at Benton High School in Arkansas. Herring first experimented using Sphero, essentially a programmable ball, when her American literature class was studying the writing of early settlers. 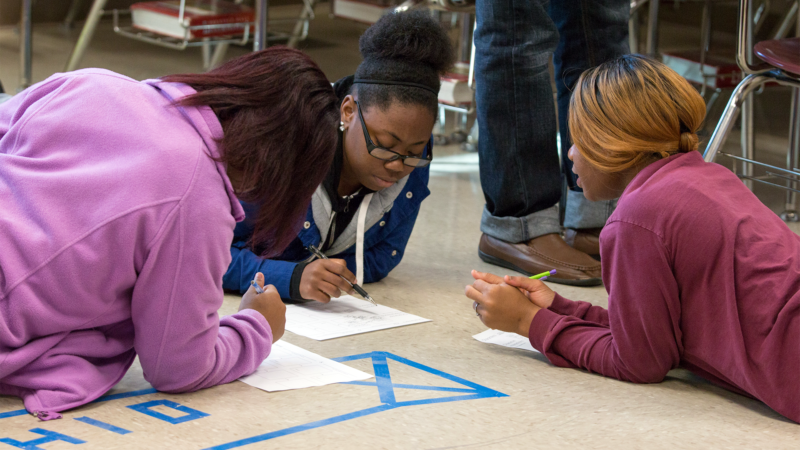 Herring pushed the desks back and drew a maze on the floor with tape representing the journey from Europe to the New World. Her students used class iPads and an introductory manually guided app to steer their Spheros through the maze. Herring, like many English teachers, was skeptical about how the Sphero robot could be a useful teaching tool in her classroom. She thought that type of technology would distract students from the core skills of reading, writing and analyzing literature. But she decided to try it after hearing about the success of another English teacher across the country. “The conversation we had afterwards about those explorers coming to the New World was really amazing,” Herring said during a presentation on her experiences at the International Society for Technology in Education (ISTE) conference. Because students had struggled to keep their Spheros in the maze, they understood in a personal way how frustrating it must have been for early settlers who got lost, backtracked and eventually made it to a new land. “They went from piloting these robots to talking about these bigger ideas and having this empathy for people in history,” Herring said. Students commented that they could understand why the Puritans had to believe in a higher power while making the journey, and expressed respect for their tenacity. Herring began to see how the Spheros could give students a more visceral point of connection to themes in the books they were studying, and began scheming more ways to connect programming to reflection and writing. After her students had that initial experience exploring with the Spheros, Herring decided to increase the complexity. For the next Spheros project, students chose a character from Mark Twain’s classic novel Adventures of Huckleberry Finn and programmed their Spheros to represent the personality, emotions and journey of that character. 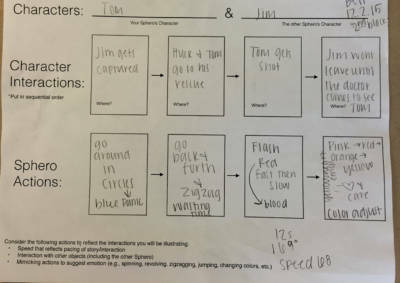 To do this, students had to go back to the text and use close-reading strategies to find textual evidence that would back up their interpretation of the setting, motivations and feelings of the character. Then they had to decide how the Spheros, a simple round ball that can light up, could represent those qualities. For example, one group chose “drunk Pap” as their character. They programmed their Sphero to zigzag across the river (marked out on the floor with tape), stop at the house, and then shake and turn red. As students went through the process they soon realized their graphic organizers of ideas were more like hypotheses; they had to adjust and add detail as they tried things in the programming language. “The programming process models the writing process,” Herring said. Many of her students struggle to see writing as an iterative process -- they prefer to dash something off and never look at it again. But as they collaboratively planned their storylines, tried programming different representations into the Spheros and modified their approaches, they began to see the importance of revision. In her honors class, Herring used the Spheros for a project on Beowulf. Together the class studied the three different battles between Beowulf and Grendel. Then students split into groups and chose different battles to represent. They had to code their Spheros to not only represent the actions of their character in the battle, but also collaborate with the group representing their opponent so that the interactions in the battle matched up. “The alignment of the two programs was really challenging and they liked it,” Herring said. 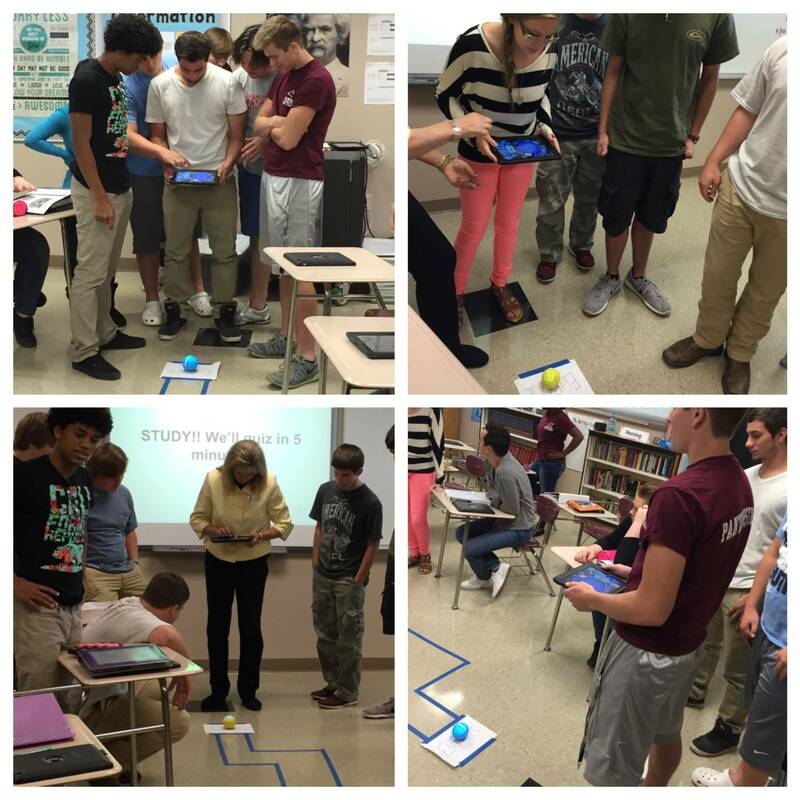 Herring tried the Spheros activities with both her honors British literature class and an on-level class. The two groups of students reacted differently to the assignment. The honors students were more reluctant to jump into the project, seeing it as “playing around,” not serious work. They wanted to continue doing what they were used to -- analyzing text and writing papers. “When we think about higher-level kids, we think they’re really reflective and understand how they’re learning,” Herring said. “But sometimes they’re so overwhelmed by all these highly rigorous courses that demand a lot of them that they don’t have time to think.” As their teacher, she could see that they were digging into the text, closely reading, listening to one another, articulating their opinions and collaborating, but she had to actively point out these aspects to students. Many of these students had struggled to care about English class, but when Herring let them show their thoughts in a different way and discuss before writing, their ideas flowed on paper more easily. And Herring is intentional about allowing students to revise work for a new grade to make sure her grading policies for writing mirror the kind of growth mindset she seeded with the Spheros programming. Herring admits that she likes to keep her assignments fairly open, and that lack of structure can fluster students who have been told exactly how to complete assignments in the past. But Herring tells them she’s giving them freedom because she believes in their ability to impress her, that they can come up with far more creative approaches if she doesn’t give them a framework. “It was so incredible to see how that freed them up to see that ‘my brain has value. I’m a creative person,’ " Herring said. She also found that when students got out of their desks and worked together, different students tended to shine. She saw leadership and innovative ideas out of students who previously seemed checked out. “I think it changed their perspective of themselves as learners,” Herring said. “They felt more confident. They were more willing to take risks.” Some of the students in her on-level class are now planning to take honors classes next year. Throughout the year Herring experimented with different programming apps of various complexity to scaffold her students in their programming skills, as well as their literary analysis. She started them out on the manual app, which isn’t really programming, but gave students a chance to play with the technology and get over its novelty. For the next project she asked students to use Sphero Drive N Draw, an app that takes a step toward block-based programming by letting students draw the path the Sphero will follow. Most of Herrings projects used the free app SPRK Lightning Lab, a block-based coding app. For students who want more control over the code, Sphero Macrolab and orbBasic for Sphero require the user to actually write code. Herring didn’t use these two apps because she worried if the coding got too complicated and challenging, it would distract from the literature focus of the project. Herring herself had almost no experience with coding when she launched this project. “We really didn’t go in with me as an expert,” she said. “I think that might have ruined it.” When she was learning alongside her students it gave them a chance to become the experts, to show her things they had figured out, and to reinforce the playful nature of trying something, improving on the design and working toward an ultimate product that made them all proud. When Herring introduced the Spheros experiment it was her first year teaching high school after several years at the local middle school. She first learned about Spheros in the classroom from another educator teaching in New York state. Veteran teacher Richard Perry was frustrated that his upper-level AP English students weren’t connecting with the heart of John Steinbeck’s novel The Grapes of Wrath. They weren’t having trouble analyzing text, but he could see that they didn’t seem to have much empathy for the experiences of the Joad family. He hypothesized that there was too much distance between students’ privileged socioeconomic backgrounds and the experience of the Joad family; instead of empathy for the characters, students felt annoyed that so many bad things happened to them throughout the book. Perry decided to build a mountain and assign student groups a Sphero that represented their family traveling over the mountain. “The whole idea was to make sure the kids understood you can be a good, hard-working person and sometimes the situation is still going to be aligned against you,” Perry said. Perry gave student groups a few class periods to get familiar with the Spheros, then he brought out the mountain he had made out of cardboard and AstroTurf. Students got a few class periods to work on programming their Sphero to get over the mountain and were expected to document their successes and failures. Finally, each group got five minutes to try to navigate their “Joad family” over the mountain. Perry had built in traps and at times the Sphero would cut out, as the Joad family car had done. “The first year none of the families succeeded,” Perry said. But students had gained a lot of empathy for the Joad family, which showed up in their writing. The second year, Perry used the same activity, which was also an inclusion class. Perry said one of the students in that class was blind, and although incredibly bright, struggled with being seen as “disabled” by peers. He explored the mountain by touch and ended up identifying some of the tricks for his group. 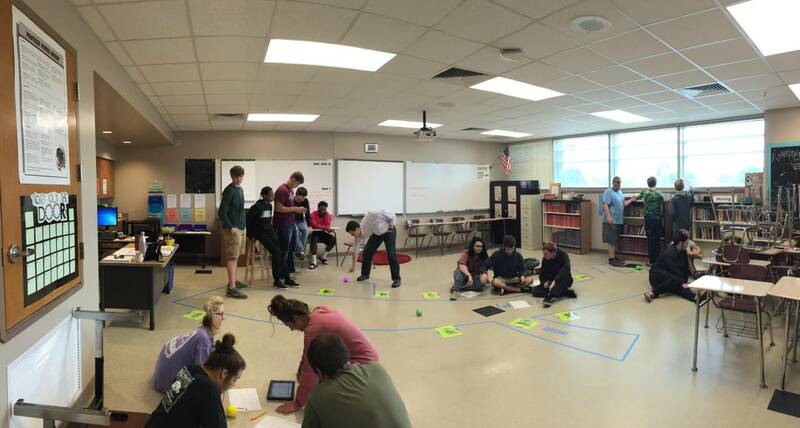 Perry took the Spheros activity to the next level when his 10th-grade students were reading Lord of the Flies. In discussions, it was clear that students were having a hard time connecting with the themes of the book. They didn’t believe humans would act the way the boys on the island did, and had no perception of what survival would have been like. Perry designed three challenges to represent surviving on the island: a shelter challenge, fire challenge and a pig hunt. He then assigned each student a character and doled out different abilities and resources depending on the character’s personality. For example, the Sphero representing Piggy was programmed to go half as fast as the fastest boy’s Sphero, but because he is a resourceful, smart character he had more tools to complete the challenges. “We gave them the chance to really step into the shoes of those kids,” Perry said. And when it came to the pig hunt, a culminating scene in the book, the students “went all Lord of the Flies on each other,” ganging up on the weakest among them in order to win. “We had that moment when the light came on,” Perry said. Students had unwittingly acted exactly as the characters did in the book. Suddenly all the theoretical arguments they made before the activity fell flat. To improve the project next year, Perry plans to have students set the parameters for the different characters based on textual analysis. Both Herring and Perry are excited at how such a simple robot like the Sphero could activate student thinking, discussion, excitement and empathy in their classrooms. They’re thinking about how they might have their classes collaborate and learn from one another, especially because Herring’s students are more ethnically and socioeconomically diverse than Perry’s. “I feel like what we’re doing is really transformative and can be applied to other classes that are not literacy,” Herring said. She sees history as a natural application, but also realizes her students were using geometry and physics, among other disciplines, when programming their Spheros. The interdisciplinary nature of the project is part of its strength in her mind. She hopes more teachers will be open-minded about letting students have a kinesthetic experience that gets them out of their desks to grow into more confident learners.